Botswana-Agate belongs to the Quartz family of the banded Chalcedony variety. It’s banded mostly in shades of grey and pink, although there are some layers that may have a soft apricot or brown shade. Botswana Agate can help those who have repressed emotional issues that need to be addressed so that they can let go and heal. 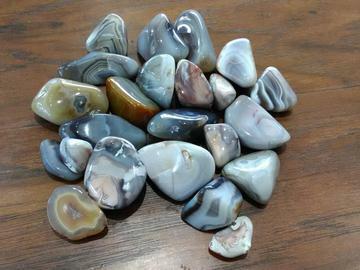 Many feel that Botswana Agate has an anti-depressant quality. Botswana Agate stimulates the exploration of the unknown and furthers one's quest toward the enlightened state. Carry Botswana Agate to promote creative ability in any project or goal. Stone Sizes Range From - 3/4" -1 1/2"